Jacksonville plans rally to defend the working class | Fight Back! 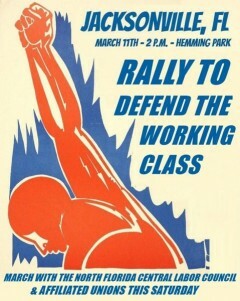 Jacksonville, FL – Workers and trade unionists are preparing for a rally to defend the working class in Jacksonville. On March 11, beginning at 2 p.m. in Hemming Park, labor activists plan to rally and march to protest attacks on the working class, including national ‘right to work’ laws being debated in Congress. The rally, originally proposed by the Young Workers of Jacksonville, has been endorsed by the North Florida Central Labor Council (CLC), a strong coalition of AFL-CIO unions. Labor recently saw Kentucky and Missouri pass laws to join 27 other states in becoming ‘right to work.’ These laws have nothing to do with helping workers in America. These measures aim to undermine organized labor, forcing unions to bargain, represent and defend non-union members who don’t pay into services rendered by the union. Workers in right to work states make an average of $6000 less than their counterparts in non-right to work states and union density is far lower. However, there is hope in Jacksonville. Workers from the CLC and their allies are banding together for a day of action in downtown Jacksonville to defend the working class. Vote NO on National Right to Work, the Employee Rights Act, and any other legislation attacking unions and workers' rights. Vote YES to protect workers' pensions and NO to any cuts. The rally is the latest in a series of mass protests against the Trump administration and the GOP-controlled congress. Trump’s presidency marks the beginning of a massive government-led employer offensive against labor unions, collective bargaining and workers' rights. The list of speakers will include several prominent labor leaders like John Palmer and Kim Schultz, recently elected Southern Region Vice Presidents for the Teamsters, along with local labor officials. The Rally to Defend the Working Class is an important step in labor’s resistance to Trump’s agenda. Organizers with the North Florida CLC and the Young Workers of Jacksonville hope to see similar Labor rallies in other cities across the U.S.
For more information, please join the Facebook event.